Many of you remember Dave Selden. Red Sox fan, blogger. He went AWOL about four years ago after starting a little side-business selling little pocket-sized beer-tasting books. I admit that at the time, I thought he was crazy: who wants analog, dead-tree books when you have 79 apps to choose from? Who uses pencils any more? But as my lovely and talented wife has noted many times, my ability to understand monitization opportunities is moron-level low. And so of course 33 Beers became a smash hit. Dave expanded the line to other potables (wine, coffee, whiskey), edibles (cheese and chocolates) and even smokables (cigars). He has lately moved beyond the page and gone to the wall. 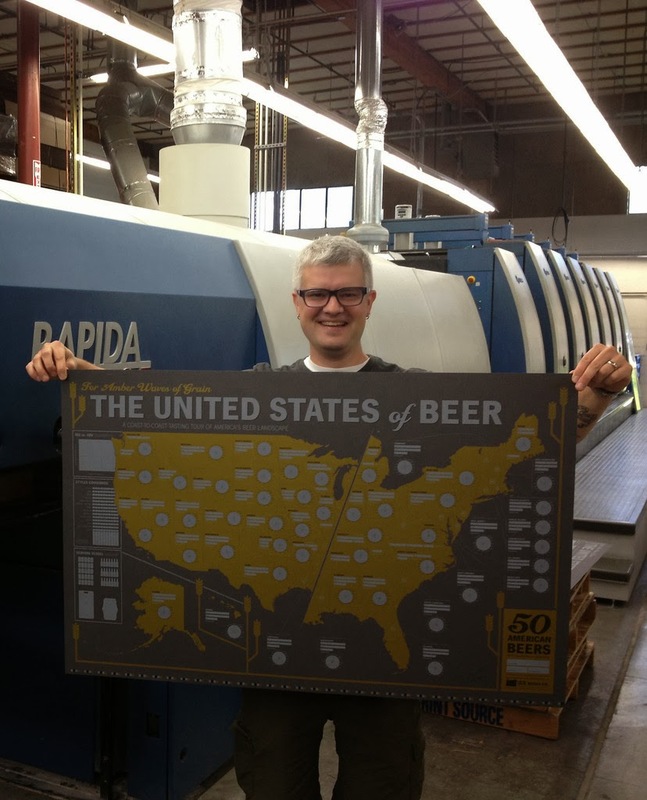 The United States of Beer, A Tasting Map is essentially 33 Beers in geography. It's a map of the US, and each state has an entry for one beer, along with Dave's trademarked (though I believe only figuratively) flavor wheel. It's an object for completists--trying to rate a beer from, say, North Dakota or Alabama may be a chore for ... well, people who don't happen to live in North Dakota or Alabama. But when I started thinking about filling out other states (Dave sent me a sample poster), I realized that abundance had its own difficulties. Which beer, for example, would you place in Oregon? Good luck with that. I can attest to their quality. They're printed on heavy-duty paper and have the good design Dave is known for. The concept is easy enough to grok that you will know immediately if this is a product you or that beer geek in your life absolutely must have. They sell for $25 and you can go here to order online.